OTTAWA -- Prime Minister Justin Trudeau was forced to pay a $100 fine for violating conflict of interest rules by not disclosing a gift given to him last year by P.E.I. Premier Wade MacLauchlan. Trudeau's press secretary says an administrative error was to blame for not filling out the proper forms and declaring the gift within 30 days. Conflict of Interest and Ethics Commissioner Mario Dion's office confirmed he administered a financial penalty of $100 to Trudeau, which has since been paid. "The prime minister has great respect for the work of the commissioner's office and will continue to follow his advice and guidance," PMO press secretary Eleanore Catenaro said in an emailed statement. This marks the second time Trudeau has been censured by the ethics office. In December, then-commissioner Mary Dawson found Trudeau broke Canada's ethics laws over two all-expenses-paid family trips to a private island in the Bahamas owned by the Aga Khan. 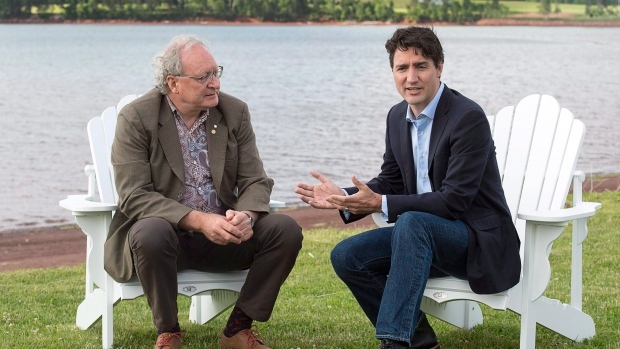 For his part, MacLauchlan was pleased to offer the made-in-P.E.I. sunglasses to the prime minister and his wife last year, says Mary Moszynski, the premier's acting director of communications. Trudeau and his wife, Sophie Gregoire Trudeau, have been spotted wearing them on several occasions in Vietnam and in Ottawa, much to the delight of the local company owners. "The premier is always pleased to showcase locally-made products from the Island," Moszynski said.